Let’s start with the Golden Goose Real Estate “final chapter.” Up for question was whether or not the GGR would reset, and allow players to start collecting Free Land Tiles, once new land was added. But, as we saw this week…the answer appears to be, “NOPE!” The GGR didn’t reset for those who had “tapped out” of land beforehand. Whether it will in the future, is still a mystery. And, to confuse things even more, we are getting more land tiles as part of the prizes during the event. Those of us who are still getting them every 12 hours with the GGR, really don’t care that much. And, if this is all of the land we are going to get for a while (as it seems that this is the last of the unclaimed land on the map), I’m not in a huge rush to grab it all. I do find it interesting, that there seems to be a relative split between the “Gotta Rush To Get It All” types, and those who are happy to just take the game as it comes, not obsessing with what we might still have in unused land, or every single item. It’c called moderation, folks. And it is a good way to live life. Take your time…enjoy each stage…be happy with things as they come, rather than festering for what you don’t/can’t have. The paradox of giant amounts of unused land, while facing item limits if you design too robustly, is not lost on me. But, like everything in life, there are limits. And it seems…that the big cosmic joke with the GGR, is that it forces you in some ways to just start gobbling up land you might not be able to use to its fullest, with the imposed Item Limits in place. There’s some huge life lesson there. I’m just too tired of funerals to care right now. EA is like that. Talk about “the mysteries of life.” Is this all by a huge plan, some strange way of rewarding and then taking away? Who knows? It could just be that someone forgot to send the memo to the guys programming the event…that we got the GGR during the last mini-event…which would add to my belief that EA uses teams for different segments…who rarely actually talk to one another. Or, like so many seemingly random and incongruous aspects of this game, the master plan is only known to the creator…and not for us to fully understand. But, just when our heads were almost raw from scratching them in wonder, we DID get the Full Town Photo Tool! And it is super cool! I am not kidding about how long we have been asking for this. As memory serves (and a bunch of old archived emails supports), one of the original TSTO hacker-dudes, a guy who went by the name of “spAnser” had worked on a way to hack this, clear back in 2013. He was thrilled….and thought that maybe EA would want it. Not so much. But, what is amazing about the way this tool works, is that how quickly and seamlessly it works…when it works. You do need enough free memory…and it does take a couple of minutes...but the result is pretty cool! 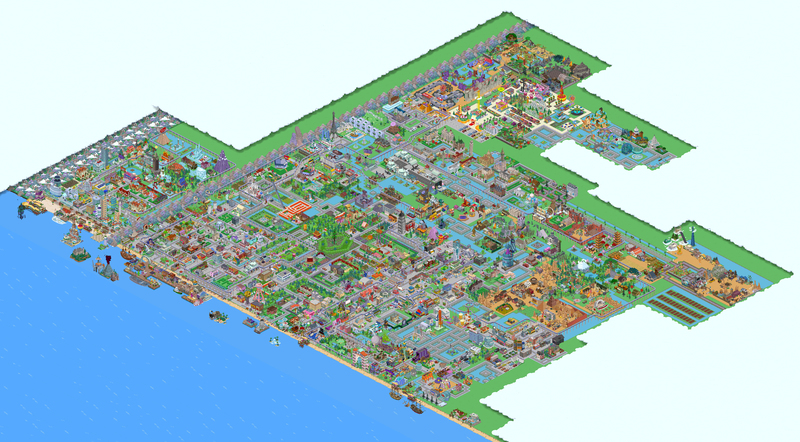 My Current town…CLICK TO ENLARGE…it’s HUGE! 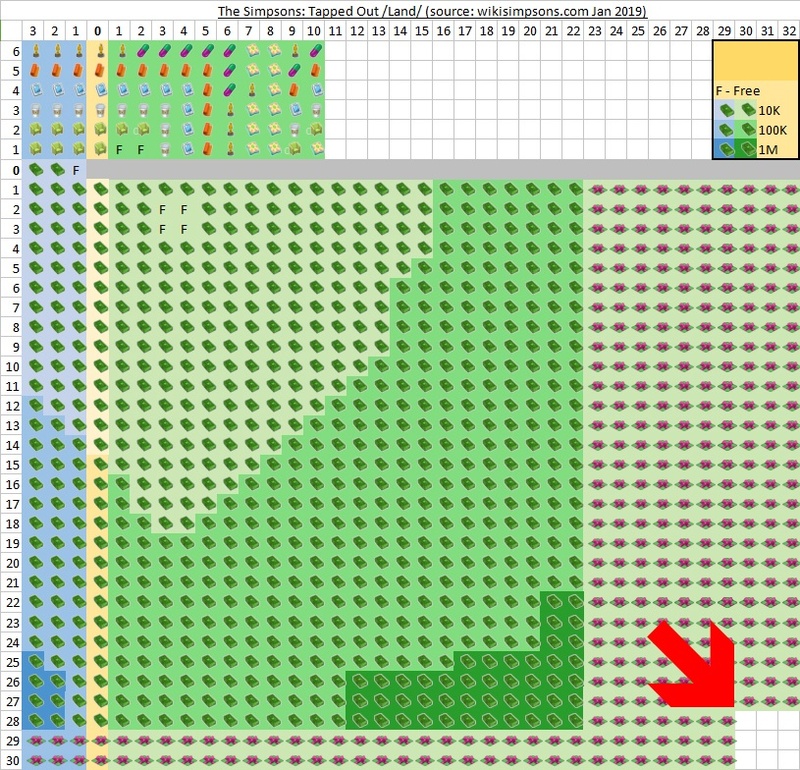 It really shows how much land I have that I haven’t tapped yet…and why I am thrilled with the GGR to help get it all faster (except for one square…right?). I have already started redesigning a few chunks on the fringes. But, looking from this view does make me appreciate even more the huge chunk of parks, forests, and the Buddhist prayer forest in the middle of my old town. It is also far easier to see my original inside joke…my huge “Peeing Man,” something I added in the first couple of months of playing. Still makes me chuckle. It’s like a life review…right before they pull the plug. But, that would be jumping to conclusions…and trying to “understand the mind of EA,” who for us is the omnipotent all-knowing power that has a great plan for us, yet undetermined. Or. It’s all just a huge random computer program that has lasted far, far longer than anyone thought it would. Either way… take the time to enjoy it. Don’t rush. Appreciate what you have…and pay attention to the details. It’s a game. It’s supposed to make you happy. Here’s the deal folks…the past few weeks (three funerals in 6 weeks) have pushed me toward simply appreciating every day as a gift. Life is simply too fragile to take for granted. As a followup for those who are following…Terri is doing OK. Waiting for her surgery, and enduring several rounds of chemo. But, her spirit is bright…and her courage amazing. Continue the prayers…she says they are working. Unfortunately…I was shocked to hear the news about a good friend and former teammate from my high school football team, who was getting on a plane last week…had a heart attack…and died. He was in great shape. A great guy. His family is in shock. So…like I said, you just don’t know. Today we will grieve…and secretly be thankful that it wasn’t our time. We’ll balance out the difference between suffering from some dread disease, and having the time to say goodbye, or having “the power on the server switched off” suddenly with no real warning. I’ll let you guys decide which feels more fair to you. I think I would choose the former…it gives you time for one last, big party. What it comes down to is a feeling of impatience, that sometimes gets in our way. The feeling to do it all, have more, and get everything the game of life offers, sometimes ends up being the wrong way to play. Do things that matter. Enjoy every day. It’s all a gift. An amazing, short, unpredictable gift. Enjoy the ride…and stop wasting time trying to figure out the next destination. The answer comes soon enough. 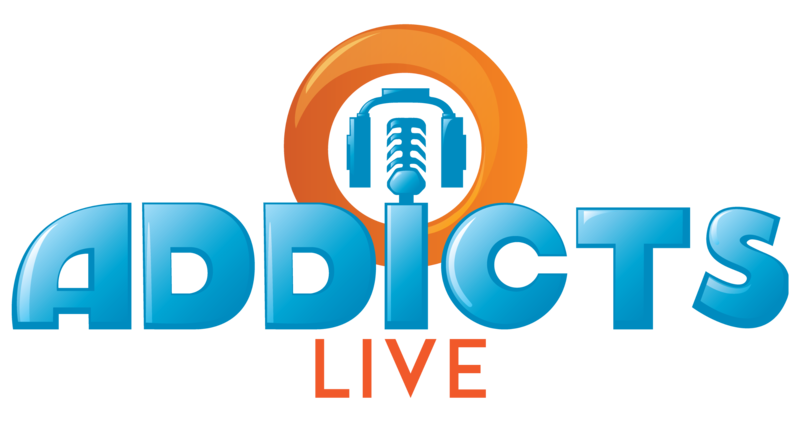 This entry was posted in Friday Filler, Tapped Out and tagged Tapped Out Tips and Tricks, The Simpsons, The Simpsons Tapped Out, The Simpsons Tapped Out Tips and Tricks, TSTO, TSTO Addicts, TSTO Community, TSTO Cranky Old Guy, TSTO Friday Filler, TSTO Patric, TSTO Tips and Tricks. Bookmark the permalink. 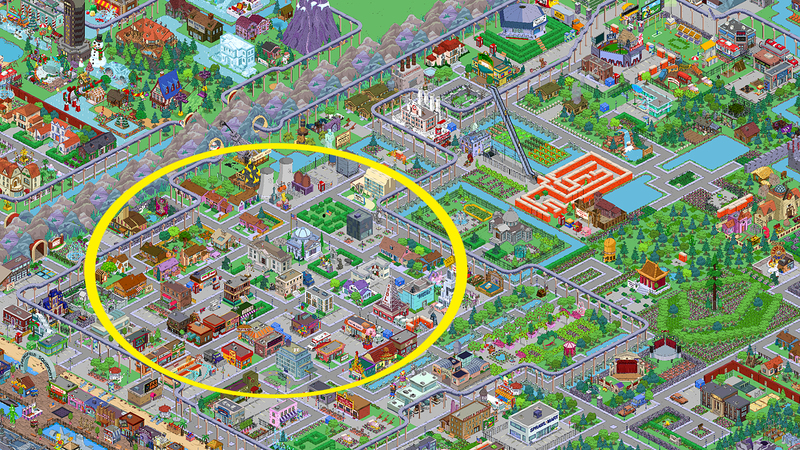 The nice thing I found about my “early life of TSTO” section is it contains most all of the buildings for the Where’s Maggie game to earn more donuts. Just don’t spread Krustyburgers or Brown Houses beyond there and you should be mostly good. My condolences for your loss, Patric. Sorry for your losses. Got to stay positive. 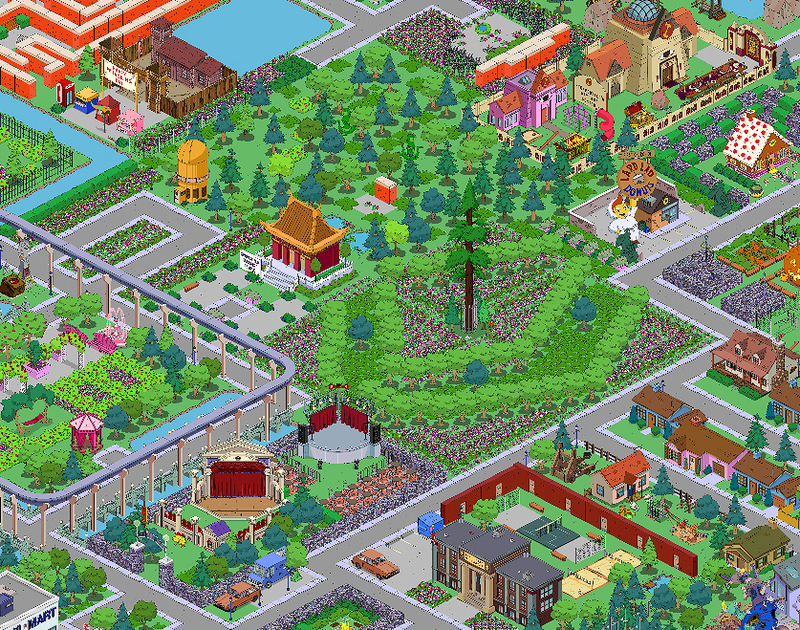 I’ve been trying to take a photo of my Springfield but it tells me that I don’t have enought memory space. I have over 1 GB free. How much do I need? Sorry for your loss. I hope you are feeling better today. But it comes with age. I know I find myself looking at the Obituaries everyday. But the good news is (insert joke here) that so far, I haven’t found mine listed. Yeah. Unfortunately this is the cap amount. The game won’t let you surpass it. I suggest you start removing some small decorations from the game like fences hidden behind buildings, shrubs, flowers and trees. I had to remove all my boardwalk fence to enable a smoother game. I try to keep about 100 under from the upper cap. I am not a religious person. Not believing in any God, in any religion. So many cruel things happen and happened in the name of a God that I think we should focus on us first and clean our moral mess up. If there truly is something like a God, it will be waiting until we are finished cleaning. matter is just frozen light and light is matter on the move. And knowing that the matter we consist of is made of 98% energy, death might be nothing else than the transition to 100% energy. Matter on the move again. And we, our life, nothing else as a glimpse of light just stopping by for a brief moment in time. Let’s celebrate this moment we had together, we will meet again out there in the universe. Yep. Been there…done that…and agree 100%. First off, sorry for the loss of your friend. Regarding the GGR, one thought I had was simply that it will get us so hooked on getting more land we start paying the 12 donuts to speed up the Ovulation cycle of the GGR. Of course there is KEM farming. Another thought was that it was a product that no one would want to miss at a time of year when people are probably not in a position of much surplus income ( just after the holidays ) might push some to spend real cash on the came for such an unbelievable. Perhaps that’s all there is to it and no great longer term strategy. Your website looks very interesting, I’ll have another look when I’m in a better state of mind, my head is foggy today probably due to poor sleep lately. Thank you for sharing Patric! Now I have a Winter one & a Summer one; Both demure & below knee length, purely for funerals. With one hat to wear with both dresses. There have been too many funerals! As a lady of nearly 60yo I’ve outlived all my female friends (most sadly gone to breast cancer) & nearly all my male ones (excepting my husband – though heart attacks have caused problems) – I’ve a male High School friend left thanks to a kidney transplant. I think he dodged the bullet there & is currently touring Australia in a 4WD & campervan with his new lease on life. In my younger years it was the males that went… Motorbike & car accidents mostly; Medically acquired AIDS for my best friend back in 1993 – That was hard to bear as the hospital he worked for gave him the tainted blood transfusion back in 1988 when he had a gall bladder operation. I still miss him to this day! I just realised that people might think my kidney transplant friend was a drinker! No! He was born with only 1 kidney & that started to fail in his early 50’s. Hence the transplant. My friend; Always known as Tank; Was a footballer & cricketer. A big bloke, who always carried some extra weight around the middle. I had to cry when one of his pall bearers was a bloke we used to call “Tiny” – because he was the small younger brother of the family whose yard backed onto Tank’s house when we were growing up. Tank & I were best friends & dance partners since age 13. Jitterbug & Jive was our thing! He could throw me anywhere & I always knew he’d catch me & still keep the beat! Patric. So sorry for your loss. I’m 51 and lost a dear friend 2 weeks ago. Likewise, another friend of mine has serious health problems and has decided to go to hospice. I wish I had some magical words to make everything right, but no such words exist. All we can do is wake up and be thankful for another day, grateful for all we have. I’ve been lurking here for two years but had to respond to this. You are all such good people here, nice that we can all enjoy the little things together. Ok, yeah, I’m pissed I didn’t get der Krazy Kraut from der Mystery Box….aghhhh …. It’s weird (or maybe not) but this song has always helped me during sad/dark times. And when I die and when I’m gone. There’ll be one child born and a world to carry on, to carry on. I immediately emailed EA help to see if they could fix it or roll my game back, but have not heard anything back. Better to call? It may be that the final rouge labs segments are outside the GGR grid. nope, it’s more complicated than that. I had one “old” land space available (surrounded it with biohazard walls so I wouldn’t accidentally buy it) and several of the new spaces available and *still* i got the GGR revert message. I think what may be happening is that EA is only looking at the total number of properties available before the 9 new tiles were released. If you have converted more than that number of tiles (in other words, you have less than 10 tiles remaining free), the Goose converts to cash. I may be wrong, but it seems logical. So sorry for your loss and I do understand how you feel having lost my mum the day before Christmas Eve. Currently I’m using my old phone to play till my new (8 week old) one returns from repair so I’ve not tried out the new feature I’m just doing event tapping… no farming or collecting off any houses. I really hope we’re not coming to the end of our game. I’ve played it in my own country ie the UK and at least 3 more in Europe and 1 in North Africa (boy that one was hard). I even play when I’m away touring in my caravan as it actually gives structure to my day. Let’s hope we’ve got at least another 5 years. I’ll be happy with at least another two… which may be as long as the show is on the air. Anyway, sorry for that maudlin turn. I posted to say that I bought all the land tiles, leaving a few water tiles back when the GGR was first released, and all was well. I continued to receive land tile tokens.When this update hit, I bought all the new land, still leaving the water not purchased. Once I bought the final land tile, I got the msg that GGR was done with land tiles for me, because I was greedy and impatient. :0) I guess water tiles no longer count as land tiles. It was nice while it lasted! It’s allowed…after all, I opened the “maudlin urn.” Yep. We are all getting to be “of a certain age,” and the key is to keep the years coming, and appreciate every one. 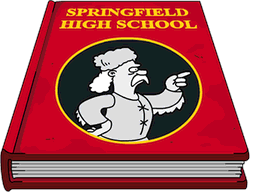 After seeing other people’s Springfield I may go ahead and blow mine up to start over. 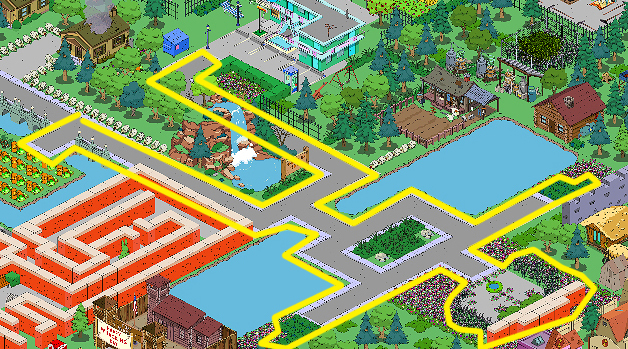 LOL… I love these town layouts. Thanks for your thoughts, Patric. I’m sorry for your losses. I’m so sorry for your pain. I also grapple with making sense of the truly good people we lose, and the @$$ hats that get to roam the earth spreading misery for too many years. Sending positive thoughts and prayers to your Terri. Thanks so much… Yes. The @$$ hats are surely plentiful these days. It may be time for a few to go. But, that isn’t our call, I guess. I’ve left a land square unclaimed as you advised but GGR has stopped producing land tokens anyway. Hoping it’s going to be reactivated at some point,do you know anything about it? Thanks for all the interesting posts you guys give us and so sorry for your loss. Hmmmm….mine is still working…but I have a LOT of land left to clear. All of my friends have disappeared. 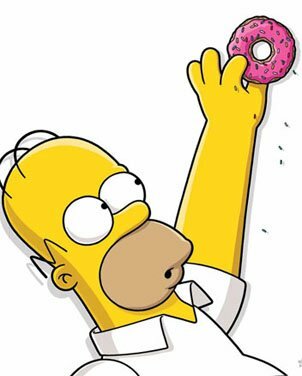 I WAS gonna complain about that damn spinning donut of death I’ve had for the last hour. I’ll just shut up instead. Sorry for ur loss. It’s OK to complain. The wheel of death is almost as irritating as real death. OK. Maybe not. But, it is irritating. So sorry for your loss. I know hearing or rather reading sorry doesn’t make up for it or help much but I truly feel for you. Thanks. It has been a crappy few weeks on the “death watch.” Thank God I broke it up with serious baby immersion with my grandson, Jake!